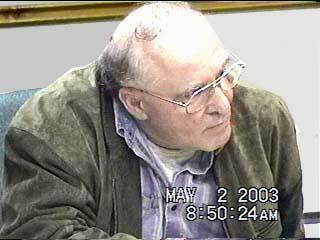 OTTAWA -- The [Canadian] federal government has filed a security certificate for Holocaust denier Ernst Zündel declaring him a national security risk. A government source said the certificate was filed Thursday night in Federal Court. It sets the stage for Zündel, 64, to be deported to his native Germany. A Federal Court judge must first decide whether the certificate is reasonable, however. If I tell you that Ernst was arrested yesterday in a maximum security cell in Ontario, where he was kept already imprisoned for almost three months, you will think that I am putting you on. At 6:25 p.m yesterday, he was arrested -- again! -- this time as a "certified" security threat to Canada. The hearing today that so many people had pinned their hopes on became moot. The Canadian Jews are crowing like peacocks -- the government minions have finally done their bidding. There will be another secret hearing on Monday, and then there will be a Federal Court review -- as I understand it, within a week or so. After that, chances are that the struggle is going to shift to Germany. Already I have people waiting from as far away as Brazil who have offered to volunteer to help Ernst serve his time as "stand-ins" -- or should I say "sit-ins"? There will be more tomorrow -- today I am just too drained. Zündel, who has fought losing skirmishes in the Canadian courts for a decade over his hate propaganda and Holocaust denials, has been in custody in Thorold, Ont., since Feb. 19. He applied for refugee status in Canada to avoid outstanding charges in Germany after being forcibly returned to Canada by the U.S. government for overstaying a visitor's visa. Zündel was scheduled to have an automatic review of that detention Friday. The security certificate allows the government to continue holding him in detention and also serves to suspend his refugee application. Immigration Minister Denis Coderre, who promised in February to remove Zündel from the country, was not immediately available for comment. Zündel moved to the United States in 2001 after a long-running human-rights complaint alleging he spread anti-Semitic literature. He built a reputation as a hatemonger for his repeated denials of the Holocaust and his glorification of Nazism. A report prepared by the Canadian Security Intelligence Service says Zündel is a national security threat who would act as a "lightning rod" for white supremacism. "There are reasonable grounds to believe that he has supported groups and individuals who advocate and use violence to achieve their objectives," the report says. If deported to Germany, he would face charges of suspicion of incitement of hate. The charges stem from material on his Web site that denies the killing of six million Jews by the Nazis during the Second World War took place. At a recent refugee hearing in Niagara Falls, Ont., Zündel said he was merely a human-rights fighter concerned with helping the German people. "I am known as the Gandhi of the right," he said. "What I defend with all my heart is my ethnic group." 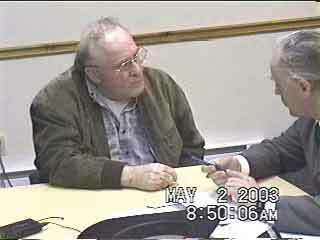 Above: Zündel confers with his defense counsel Douglas Christie. 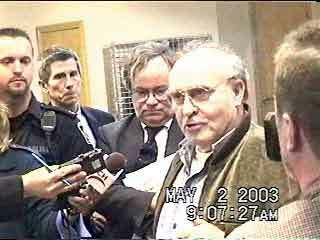 Below: Zündel answers questions of the press: in the centre, Paul Fromm, director of the Canadian Association for Free Expression. Globe & Mail: Bernie Farber's outrage as Zündel applies for refugee status| Outrage of Canadian Jewish leader: Zündel back in Canada | Zündel seeks refugee status (CTV) | B'nai Brith Outrage: "Now he's our problem"